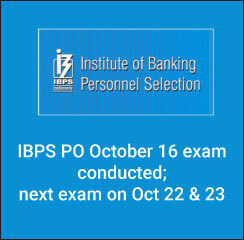 Institute of Banking Personnel Selection (IBPS) has begun conducting IBPS PO / MT VI exam for the recruitment year 2016 as the CWE PO exam for first session was held on October 16, 2016. The bank PO exam will be conducted for two more days, i.e., on October 22 and 23, 2016. Career Launcher has announced expected IBPS PO 2016 exam cut off after the October 16 PO examination, where it shared that questions in the examination were mostly of easy to moderate in difficulty scale. As per IBPS PO 2016 exam pattern, there were a total of 100 questions carrying one mark each, which were to be attempted in 60 minutes duration. The preliminary examination for IBPS PO 2016 consisted of 35 questions each from Reasoning Ability and Quantitative Aptitude whereas English Language section had as many as 30 questions. Candidates attempting the questions correctly will be awarded one mark each and 0.25 marks will be deducted in case of each of the wrong attempts. Moreover, questions non-attempted by the candidates will be awarded zero (0) marks. Those who shall be qualifying in IBPS PO 2016 preliminary exam will be selected for the IBPS CWE PO 2016 Main examination that is scheduled to be held on November 20, 2016. The shortlisting will be based on cut off scores as declared by the examination board. Career Launcher, after the October 16th examination for CWE PO positions has declared the IBPS CWE PO 2016 cut off marks as expected by it. The coaching institute has expected the cut off of PO 2016 examination to fall in between 45 and 50 for General category candidates, whereas for OBC category between 40 and 45, SC between 35 and 40 and 25-30 for ST category candidates. Career Launcher has also announced the sectional cut offs for each category. IBPS PO 2016 results for the preliminary stage will be announced by the first week of November, after which the second stage, i.e., Mains examination will be conducted. Institute of Banking Personnel Selection has announced as many as 8822 vacant positions for CWE PO rank for which it is conducting the IBPS PO recruitment examination.